I’m a huge fan of iPhone photography, in fact I have over 40 photography related apps on my phone. I always have my phone with me and some of my favorite photos were taken from it; including many that you see on this blog. Last week while I was getting ready to pack for our trip I stumbled upon an ebook, iPhone Photography, by Alli Worthington. I didn’t even realize Alli had written an ebook (I’m a bad blogger and don’t keep up with what everyone is doing) but I knew it would be good. If you don’t know who Alli is, she is a blogger and the founder of the Blissdom blogging conferences. She is beautiful, spirited, and incredibly talented. I immediately purchased the ebook so I could have some reading for our trip. WOW!! 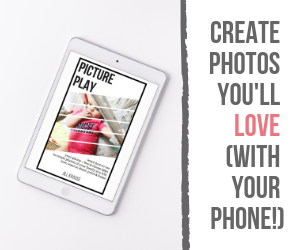 I wasn’t prepared for 173 pages full of gorgeous iPhone images, tips, app recommendations, and personal photography advice. I read the entire thing on our car ride up to the cabins. I immediately installed several new apps (mostly free) that I’m learning to love. Some of my favorite apps so far include Camera+, Pixlromatic, and Camera Awesome. I was a crazy woman taking pictures the entire weekend using my iPhone even though I had my camera with me. The only time I used my camera was when we were on the river (it’s a waterproof camera). You can see some of my novice iPhone photos that I shared in a recent post about our trip to Ichetucknee Springs. Now if only Apple would hurry up and release the iPhone 5, I might be able to have better quality shots than what I get on my 3GS. Do you take photos on your iPhone and wish you could learn a few tips to help you make them look better? You can purchase Alli’s ebook, iPhone Photography, for only $5, but don’t delay because the price is increasing on July 31st. Go grab your copy today and then tweet/Instagram me a fun picture that you took using your iPhone. Disclosure: I purchased my copy of Alli’s ebook and honestly love everything about it. Some of the links in this post are affiliate links. If you purchase Alli’s ebook using the links in this post I’ll earn a small commission. Thank you!! What a fun post! I’ve really been into photography apps lately, too, so this is perfect. I just might need that book!